Rally outside the Minnesota House of Representatives opposing Line 3. 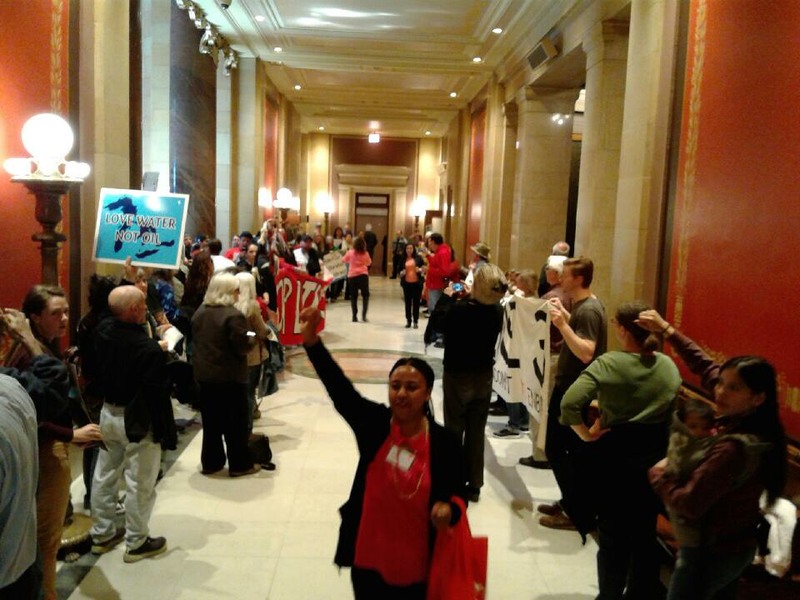 More than 125 people gathered in front of the Minnesota House of Representative’s chambers Thursday for an emergency rally opposing a deeply flawed jobs and energy bill. The bill weakens public review of proposed crude oil pipelines in Minnesota in general, and it specifically fast tracks the Enbridge Line 3 tars sands oil pipeline proposal. Enbridge wants to replace its badly deteriorating Line 3 crude oil pipeline with a new and larger pipeline – and reroute it in the process. The new path would take it through the Mississippi headwaters regions, risking great environmental damage if there were a rupture. The proposed route also runs through prime wild rice areas and violates treaty rights which give Ojibwe people hunting, fishing and gathering rights to a large section of northern Minnesota. For full blog, click here.